As always, when pairing wine with chicken, you want to consider the sauce or the marinade. Here, five approaches to take this summer when choosing wines to serve with grilled chicken. With simple marinades. Simply seasoned grilled chicken is one of the most versatile foods and pairs well with a range of wines. (Have a special bottle you want to open? Make grilled chicken!) Because of the char and smoky flavors that infuse the meat, you can go for wines that have seen some new oak, including Chardonnays and some California Pinot Noirs. If the chicken is rubbed with lots of herbs—like rosemary and thyme—rosé or lightly chilled, juicy Spanish Garnacha is a good bet. With barbecue sauce. If your chicken is brushed with a sticky barbecue sauce, go for fruity, low-tannin reds, like Zinfandel or Primitivo (Italy’s version of Zinfandel). These wines have deep berry flavors and an almost sweet fruit quality that’s great with these sauces. 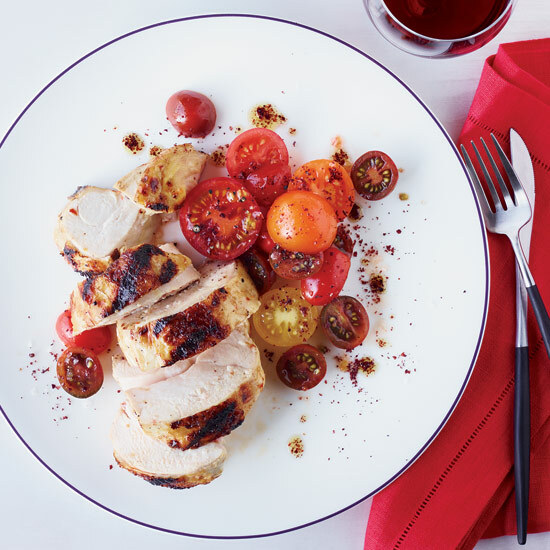 If you tend to lean toward white wines, try a California rose, which also tends to have ripe, almost sweet fruit but enough body for this style of chicken. Mustardy. Some barbecue sauces have lots of mustard, which can make the chicken better with whites or light reds. If the sauce is sweet, try an off-dry German or Oregon Riesling. (Sweet sauces tend to like sweet or very fruity wines.) If the sauce is tangier, try dry Austrian Riesling or zingy unoaked French Chardonnay from places like the Mâcon. A red option? Lightly chilled Beaujolais. Spicy marinades. If your marinade includes chiles, you can’t go wrong with serving a slightly off-dry Riesling. The heat of the marinade will make the wine taste less sweet. Bonus: Rieslings tend to be low in alcohol, making them easy to drink on a hot summer day. Yogurt marinade. These rich, spiced Indian and Middle Eastern-style marinades give grilled chicken a great browned crust. That crust is especially good with full-bodied white wines, like California Chardonnay. If you want to go for something more unusual, look for Chenin Blanc (from places like Vouvray and Savennières in France) as well as Gewürztraminer or Pinot Gris.